Abi Gnanadesigan is a member in the Litigation Department in Dykema's Los Angeles office. Her practice focuses on complex commercial litigation and intellectual property litigation, and she represents corporations, financial institutions, employers, and court-appointed receivers in a variety of litigation matters in state and federal court, and in mediation and arbitration proceedings. 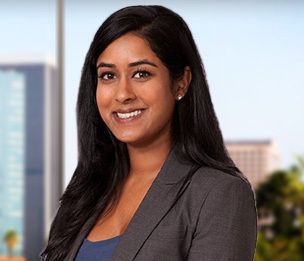 Ms. Gnanadesigan has extensive experience handling state and nationwide class action lawsuits on a variety of issues, including wage and hour claims, California's Unfair Competition Law, and the Consumers Legal Remedies Act. She recently served as second chair trial counsel in a seven-day contempt trial, which resulted in a judgment of contempt and an award of substantial attorneys' fees and costs in favor of her client. Abi is committed to giving back to the community and dedicates part of her practice each year to pro bono work. She served as a law clerk for the HIV & AIDS Legal Services Alliance and has volunteered for Bet Tzedek and the Los Angeles County Bar Association Domestic Violence Project.